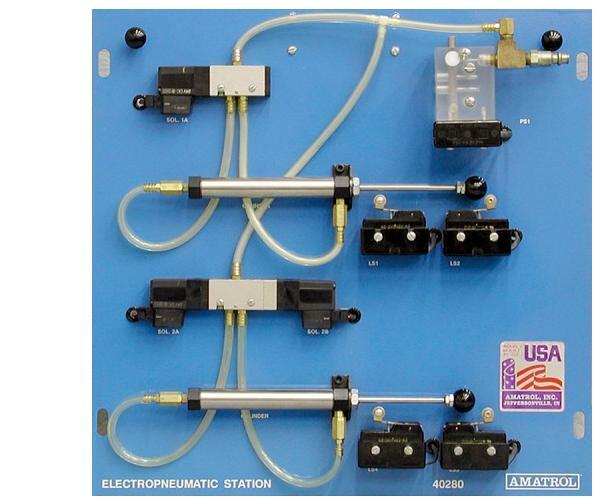 The model 89-EP Electro-Pneumatic Application Station adds to the 890-PEC-B Programmable Controller Troubleshooting Learning System to provide pneumatic actuator automation applications. The 89-EP includes two double-acting pneumatic cylinders, solenoid-operated directional control valves, speed control valves, limit switches, and a pressure switch. Components are mounted to a silkscreened panel and wired to a single interface connector, which automatically plugs into the 890-PEC-B I/O and fault system when the panel is inserted into the 890-PEC-B workstation console. All components use 24VDC control power.